But am worried about the loss of paintings & relics from the past in there. How many of *them* have been salvaged? I say this as not being of the Catholic faith, but is so terrible a thing to have happened at this Holy time of year for all of us. I am so skeptical of that explanation at the moment. Emergency services said they were trying to salvage as much artwork as possible, with France 24 reporting that nearly all of it was able to be removed and saved. The Crown of Thorns, said to have been worn by Jesus Christ before the crucifixion, and the tunic of St. Louis were both saved, according to the cathedral's rector. Interestingly reports that there were no construction workers onsite when the fire broke out. But it started on the roof is interesting. Thanks for the info, darlin' ... Hugs! Last week, for instance, 16 copper statues representing the Twelve Apostles and four evangelists were removed with a crane so that the spire could be renovated. So the art around the spire that was lost was removed. Meaning that they are safe. 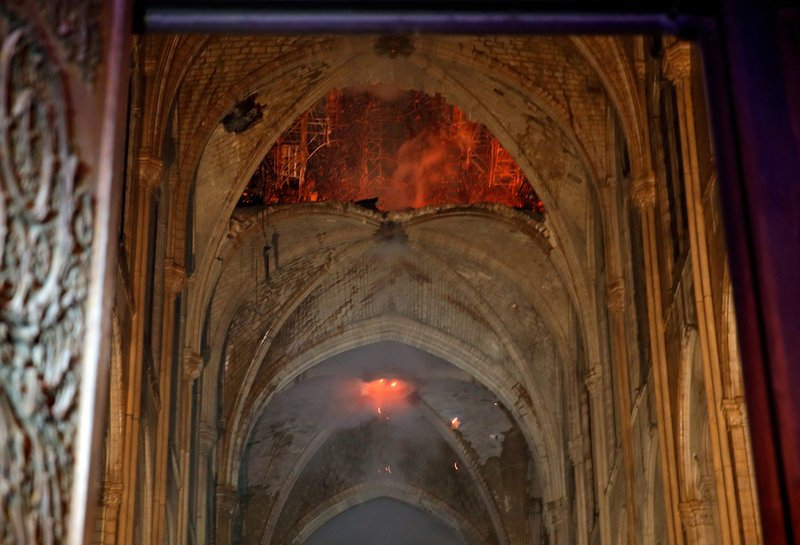 The hole in the interior caused by the spire collapse. The large stain glass windows seem to be intact, but unknown if any damage may have been done. The original workover budget was $185 mill with the French government kicking in $50 mill of that. So what has been spent to this point other than removing some of the most susceptible and valuable pieces is now dust in the wind. I personally do not buy an attack by anyone but believe it was an accident. I’m also waiting for what the post apocalypse investigation reveals. Why am I being blamed? I do zombies, not burning churches. And the cost, yea you're right. Off handed guess, I would say they will likely need north of $500 million to repair whats been done. Sure, that's what you want us to think!!! the REAL villain!!! It was TRUMP!!!!! Not this week, not in Paris, and definitely not in such a well loved symbol of Christianity in the world. This has to be the work of the enemies of Christ somewhere in this horrible tragedy. Perhaps even in some of those hired to do the renovation work? I could be wrong, but who knows? And finally have their much desired world wide Caliphate put in it's place. Last edited by ABC; 04-16-2019 at 02:36 AM. This has to be the work of the enemies of Christ somewhere in this travesty. Perhaps even in some of those hired to do the renovation work? I could be wrong, but who knows? Color me suspicious too, ABC. My first thought about the fire was not the Muslims but FEMEN, who has been doing violence to churches for quite some time. However, either group would have the same effect and are fighting for the same thing. Somewhat embarrassed, but good to see you in here! Today's events in Paris really got to me. Can't sleep tonight to save my life, (aargh!) so got up to have some hot milk & read in here, and noticed the need to change the word "travesty" to "tragedy" in my above post. Duh! Oh Mercy! Haven't done it yet, but will now. Tune in again tomorrow! See ya! Last edited by ABC; 04-16-2019 at 02:38 AM.